The blog process is really quite simple in terms of using WordPress. The real challenge for blogs is coming up with good stuff to blog about! Click the Posts menu in the Dashboard and select Add New. 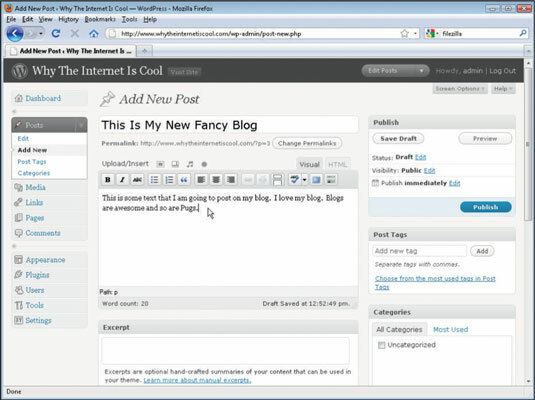 WordPress opens the Add New Post page. Give your post atitle by entering it in the text box below Add New Post. Add some text in the body text box. Use the formatting buttons if you want to change the style of your text, create a list, or otherwise add elements. Use any of the other options that you want for this post. Excerpt: If you want, you can write a short summary of your post for the Excerpt field. Post Tags: Tags are keywords that describe the topic of your post. Tagging your posts lets search engines easily identify the subject material you discuss and means your post is likely to rank higher in search engine listings. Categories: Use the Add New Category link in the Categories box if you need to create a new category for your post. Categories are general groups that you can sort your blog posts into so that readers can easily locate the content most interesting to them. Discussion: You can choose whether you want to allow readers to post comments on this posting and whether you want to permit trackbacks. Custom Fields: You can add custom fields to your posts, which you fully control. Custom fields are simply fields that appear in each blog post that you can display by altering the template for your blog. For example, if your blog is a restaurant-review blog, you might choose to add custom fields for the location or rating of each restaurant that you review. Click Publish to save your blog post and check out your blog to see how it looks! If you’re not ready to post your blog entry to the public, you can save your posting as a draft or preview it before you post it. Also, you can set a particular date if you want to schedule your post for publication in the future. Look for a Visit Site link at the top of the Dashboard; the link takes you right to your blog.